UNITED NATIONS, Nov 25 2014 (IPS) - Has the world reached a stage where nuclear weapons may be used as bargaining chips in international politics? So it seems, judging by the North Korean threat last week to conduct another nuclear test – if and when the 193-member U.N. General Assembly adopts a resolution aimed at referring the hermit kingdom to the International Criminal Court (ICC) for human rights abuses. Dr. Rebecca Johnson, author of the U.N.-published book ‘Unfinished Business’ on the Comprehensive Test Ban Treaty (CTBT) negotiations, told IPS the larger danger – exemplified also by some of the rhetoric about nuclear weapons bandied around the crisis in Ukraine – is that nuclear weapons are not useful deterrents but are increasingly seen as bargaining chips, with heightened risks that they may be used to “prove” some weak leader’s “point”, with catastrophic humanitarian consequences. She pointed out North Korea’s recent threat to conduct another nuclear test – its fourth – is unlikely to deter U.N. states from adopting a resolution to charge the regime of Kim Jong-un with crimes against humanity. “North Korea’s nuclear sabre-rattling appears to draw from Cold War deterrence theories, but a nuclear test is not a nuclear weapon,” she added. South Korean Foreign Minister Yun Byung-Se told the Security Council last May North Korea is the only country in the world that has conducted nuclear tests in the 21st century. Since 2006, it has conducted three nuclear tests, the last one in February 2013 – all of them in defiance of the international community and the United Nations. The resolution on North Korea, which is expected to come up before the U.N.’s highest policy making body in early December, has already been adopted by the U.N. committee dealing with humanitarian issues, known as the Third Committee. The vote was 111 in favour to 19 against, with 55 abstentions in the 193-member committee. The vote in the General Assembly is only a formality. Their use, after all, would involve massive violations of the right to life and other human rights. However, he noted, this applies also to the other nuclear-armed states in the region (China, Russia and the United States) and states under extended nuclear deterrence doctrines (South Korea and Japan). “The nuclear option should be taken off the table by establishing a North East Asian Nuclear Weapon Free Zone,” he said. And the states leading the human rights charges against North Korea should make it crystal clear that such charges are not an attempt to overthrow the North Korean government, he added. The tensions between countries in the region, and the fact that the Korean War of the 1950s has never officially ended (only an armistice is in place), makes this a very sensitive issue, said Ware. If the General Assembly adopts the resolution, as expected, it is up to the 15-member Security Council to initiate ICC action on North Korea. But both Russia and China are most likely to veto any attempts to drag North Korea to The Hague. In an editorial Sunday, the New York Times said North Korea’s human rights abuses warrant action by the Security Council. “Given what is in the public record, it is impossible to see how any country can defend Mr Kim and his lieutenants or block their referral to the International Criminal Court,” the paper said. “As confidence in the NPT (Non-Proliferation Treaty) continues to erode, has the time come to ban all nuclear weapons?” asked Dr Johnson. The status some nations attach to nuclear weapons would soon be a thing of the past, nuclear sabre-rattling would become pointless, and anyone threatening to use these weapons of mass destruction (WMDs) would automatically face charges under the International Criminal Court, said Dr. Johnson, who is executive director and co-founder of the Acronym Institute for Disarmament Diplomacy. As North Korea withdrew from the NPT over 10 years ago, and has already conducted three nuclear tests, it is unlikely that a threatened fourth test would be an effective deterrent, said Dr Johnson. The U.N. resolution has been triggered by a report from a U.N. Commission of Inquiry on North Korea which recommended that leaders of that country be prosecuted by the ICC for grave human rights violations. 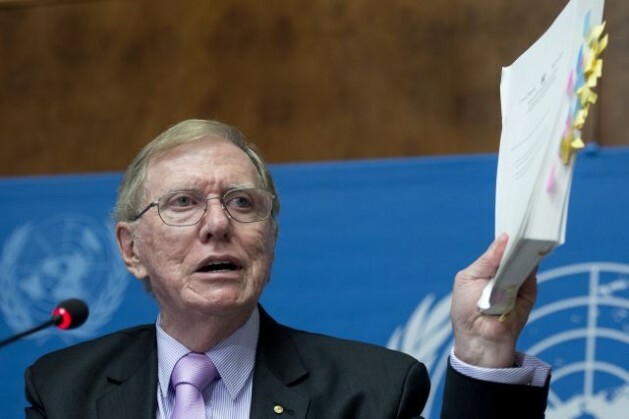 The commission was headed by Michael Kirby, a High Court Judge from Australia. In a statement before the Third Committee last week, the North Korean delegate said the report of the Commission “was based on fabricated testimonies by a handful of defectors who had fled the country after committing crimes. “The report was a compilation of groundless political allegations and had no credibility as an official U.N. document,” he added. Ware told IPS, “I have a lot of respect for my colleague Michael Kirby from Australia, who led a year-long U.N. inquiry into human rights abuses which concluded that North Korean security chiefs, and possibly even Kim Jong Un himself, should face international justice for ordering systematic torture, starvation and killings. Ware said there are indeed human rights violations in the United States, but they pale in comparison to those in North Korea. There is a body of U.S. civil rights law and legal institutions that provide protections for U.S. citizens even if it is not fully perfect nor implemented entirely fairly, he pointed out. But there is a lack of such protection of civil rights in North Korea, with the result that the North Korean administration inflicts incredibly egregious violations of human rights with total impunity, according to Kirby’s report. “I do not believe that the threat of a nuclear test by North Korea should deter the United Nations from addressing these human rights violations, including the possibility of referral to the International Criminal Court,” Ware declared. The US was the first to discreetly make an implicit threat towards Stalin to try to curb his post war expansionist ambitions. Not coincidentally, IMO, after Stalin got the bomb in 1949 did he unleash what became the Korean War to test US resolve. I don’t think he would have tried it without the bomb in his hands.